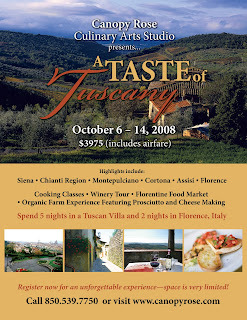 To coincide with our Taste of Tuscany promotion, we will be featuring a collection of some favorite Tuscan-inspired foods. 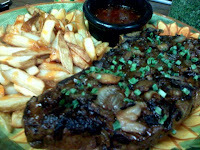 We will have these foods available for gourmet take-out and for catering. For all of our friends who visit our blog from afar, we have some special treats in store for you, too! Please return often to see what's cooking at the Canopy Rose blog. For those of you who are interested in traveling with us to Tuscany and Umbria in October please get your reservations in as soon as possible. Space is very limited! Need a copy of our travel brochure? Call us at 850-539-7750 and we will gladly put one in the mail to you. 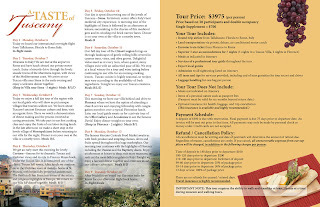 To request your own full color brochure about this trip call Canopy Rose Culinary Arts Studio & Catering Company at 850-539-7750. Questions? E-mail us at canopyrose@aol.com or call us at 850-539-7750. One of the Florida Capitol's most favorite long-time Tallahassee area caterers (Canopy Rose Catering) has opened an exciting new catering business in the nearby historic town of Havana Florida. In addition to full-service catering delivered and set-up at your special event, the Canopy Rose Culinary Arts Studio and Catering Company also offers a delicious blend of special event design, dinners-to-go, cooking classes, lunch n learn, creative workshops, corporate team building events, food styling, food writing, cookbook collaboration, food publicity, consulting, food tourism, guest chef demonstrations and foodie events. During the 2008 legislative session, Canopy Rose is available for breakfasts, buffet lunches, box lunches, receptions, cocktail parties and plated sit-down dinners throughout the capitol complex, Leon, Gadsden, Wakulla, Franklin and Jefferson Counties. Legislators, lobbyists, staff or anyone for that matter who find themselves far too busy to cook during the annual spring whirlwind of activity can have their freezers stocked with a delicious cache of handcrafted fare from the Canopy Rose Dinner-To-Go Collection. To discuss your food requirements contact Kathi Dameron of Canopy Rose at 850-539-7750 or at canopyrose@aol.com. At Canopy Rose we are covering all the bases! Whether your tastes lean to the left or to the right or smack dab in the center, you are bound to find that we'll hit it out of the ball park every time! For the absolute best in classic, contemporary or custom-created catered foods - call Kathi at Canopy Rose Culinary Arts Studio and Catering Company~ 850-539-7750. Our catering division does 2008 presidential political fundraisers, victory parties, office luncheons, legislative receptions, gala grand openings, company picnics, box lunches, product launch parties, lunch n learns, open houses, company holiday parties, drug rep lunch drop offs, banquets, weddings, anniversaries, baby showers, engagement parties, bridesmaid luncheons, tailgate parties, graduation parties, birthday parties, theme parties, black-tie soirees, charity fundraisers, beach parties, Day on the Hill Events, Association Events, Ribbon-Cutting Ceremonies, Bill Signing Celebrations, breakfasts, brunches, dinners, and much more! We serve Florida's State Capitol, Tallahassee, Havana, Quincy, Monticello, Crawfordville, St. Marks, Panacea, St George Island, Apalachicola, Thomasville, Bainbridge, North Florida, Panhandle, Coastal Communities, and South Georgia. Plus thousands and thousands of other clients during my tenure as the chef/owner of Canopy Rose Catering. * Canopy Rose Catering was a premiere Tallahassee catering operation for over a decade. The business closed a few years ago so that owner, Kathi Dameron could engage in some other creative pursuits. During this time, Kathi began writing the popular "Entertaining with Kathi" column in the Northeast Chronicle, a community publication of the Tallahassee Democrat newspaper. In January of 2008, Canopy Rose reopened as a regional culinary arts studio and catering company in a historic bank building in downtown Havana, Florida. In addition to offering catering for a wide range of special events, Canopy Rose offers cooking classes, dinners-to-go, food jaunts, cookbook collaborations, food styling, food writing, team building events and consulting. Too Busy to Cook? Canopy Rose would love to meet with you to discuss your catering needs. Kathi can be contacted at canopyrose@aol.com or 850-539-7750. Why not begin with a wide wedge of iceberg lettuce topped with with our thick, chunky homemade Blue Cheese Dressing or one of our specialty salads? Don't miss our decadent desserts! Just carry it home and pop it all in your refrigerator until just before dinner. Serving directions included on all take out dinners. Available By Advance Order Only From The Canopy Rose Culinary Arts Studio and Catering Company "Dinner-To-Go Collection." Our foods are great for everything from dinner for one or two to parties of any size. Canopy Rose is located in downtown Havana Florida. We service North Florida, Tallahassee, the capitol region, the Gulf Coast and South Georgia. We offer a wide variety of classic, contemporary and custom menu ideas for special event catering. Any day is a great day for Canopy Rose's Gourmet-To-Go! Looking for a special gift for a family member, neighbor, church member, dear friend or co-worker? Canopy Rose can help you to put together a food gift that will warm the recipient's heart. We are often asked to prepare special congratulatory meals for new parents, convalescing family or friends, sympathy meals and more. "For your family to enjoy..."
For more information on food gifts contact Canopy Rose Culinary Arts Studio and Catering Company at 850-539-7750. We are located in downtown Havana, Florida. (classes, dinners to go, catering, team building, food tours, room rental, kitchen rental, ethnic cookery, Tuscany Tour in October, cookbook collaboration, special events, food styling, food writing, Havana, Florida food tours, legislative catering, political fundraisers,etc. Canopy Rose to launch Dinner-To-Go program on the weekend of Friday - Sunday February 22, 23, 24. A delightful, traditional Cuban dish made with ground beef, tomatoes, raisins, almonds, and olives. Served over yellow rice. Pick up times run between 4:30 pm and 6:00 pm. Please let us know when you place your order when you would like your food to be ready. Other pick-up times can possibly be arranged. Pick up at Canopy Rose Culinary Arts Studio and Catering Company in downtown Havana, Florida. The Canopy Rose Culinary Arts Studio and Catering Company offers interactive team building and team bonding events where participants work together to create a delicious meal. There are several ways that Canopy Rose can structure a team building event for your group. First we will need to identify specific objectives that you have for this activity. Once we have a good grasp on what you would like for your group to achieve, we can begin designing the team-building event in a way that will best facilitate your goals. All of our corporate team building events are custom designed especially for you based on your identified objectives, budgetary requirements and taste preferences. Our menu options are as unlimited as the imagination, ideas are as close as our own Gulf Coast Regional Cuisine to ideas that jaunt the far flung corners of the globe. Kathi Dameron will work very closely with you to design a delicious menu. Canopy Rose's corporate team building cooking classes are available to businesses located in the Tallahassee Florida area, the capital region, North Florida and South Georgia. Our culinary arts studio is located in downtown Havana, Florida - a baguette toss from Tallahassee. We are housed inside the historic Havana State Bank Building at the corner of Hwy 27 and 7th Avenue. Please place your catering orders at least 72 hours in advance. Coming Soon: A Canopy Rose Lunch N Learn with Monticello, Florida book author, Karen Knox. Forget The Die-its Learn To Live-it! 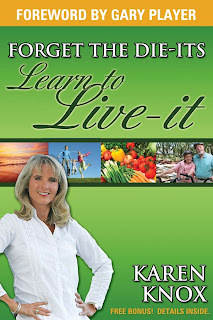 is Karen's brilliant and inspiring brand new, hot-off the press resource book that could quite possible save your life. Don't miss the opportunity to hear Karen share "live-it" strategies at Canopy Rose Culinary Arts Studio and Catering Company this spring.